The Great Sphinx has been seen as the symbol of both ancient Egypt and even for Egypt today. The Sphinx is an iconic symbol that is so widely recognized it is crazy to think that there is so much we don’t know about it. Although it is largely recognizable that information that we have about it is fleeting. The Sphinx is in many ways on of the greatest ancient mysteries; from it creation to the always changing face. The origin date of the Sphinx is unknown, the most common and agreed upon date is that it was constructed in the 4th Dynasty (2575 – 2467 BCE) by the Pharaoh Khafre. “However, an accumulating body of evidence, both archaeological and geological, indicates that the Sphinx is far older than the 4th Dynasty and was only restored by Khafre during his reign.”(Gray) Along with the indefinite creation date we struggle to figure out what the original face looked like on the sphinx. With all these questions I was intrigued to see how my own personal recreation would come out based on what I learned from my research. As I’m sure many would assume that task of reconstruction such an enigmatic figure was not an easy one. All the decision’s I made in the building of my replica where thought out and double-checked. My approach involved a lot of research and comparisons of information to see what I agreed with and thought to be most likely accurate. This was not the easiest task considering there are thousands of different opinions on what the sphinx originally looked like, who it was modeled after and when it was originally constructed. Once I finished my first step, which was research, I moved on to step 2: materials. The sphinx, “varies from a soft yellowish to a hard grey limestone. The massive body is made of the softer stone, which is easily eroded, while the head is formed of the harder stone.”(Gray) Since I am in no way equipped to handle carving stone I moved to something I knew could harden to have the effect of stone but could also be easily manipulated: clay. My decision to use clay was based on what I though would be the closest I could get to stone and still make it something in which I could manipulate it to get an accurate portrayal of what I wanted to accomplish. With clay I knew I could make the sphinx in blocks like it was made from blocks of stone but I could also smooth it down like many believe the sides originally were before they were eroded away by the sand and wind. The sides of the sphinx over time have been distressed because of the sand and wind, “The archaeological record confirms that Thutmosis did indeed free the Sphinx of sand.” (Hawass) When we learned that the sphinx was discovered with sand covering its body it was easier to understand how so much erosion could have occurred to the body of this fig (Orcutt) (Hill)ure. Making the body appear to be more rough and angular then smooth on the sides. 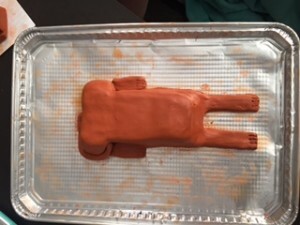 This is a picture of the smoothed down body of my sphinx. My third step was the actual construction of the sphinx. The building of my sphinx took about two hours. Once I figured out the measurements of the original sphinx scaled down to my one foot long replica the building was not very hard. 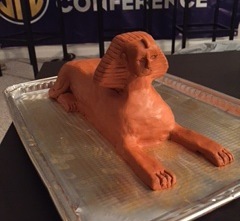 I made the sphinx one and one hundred- fiftieth of the size. The hardest part in making the sphinx was wanting to fix it so that it was proportional. Making that body the appropriate size made the head appear to be to small and the head alone appeared to large. This was hard to ignore while I was putting the two pieces together. I found it hard to remember that it was not mine to fix and make proportional. But once I looked past the discrepancies in size I then made it a point to spend time on the face. I think the head was a step in-and-of itself. This is a close up of my face early on. I was working on making the eyes uneven and the mouth off center. Step 4 of my reconstruction project was the head. The reason I see the head as its own step is because most of the controversy that surround this historical object is around the head and more specifically the face of the sphinx. Still to day we lack a confirmed identification on who the sphinx is modeled after. 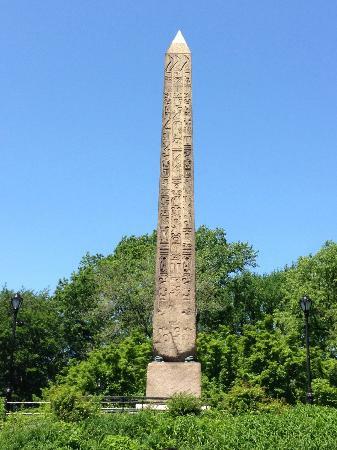 “In ancient Egypt, it wasn’t so much the physical similarity of a statue to its owner that lent its identity, but rather the name on the inscription. Statues were idealized representations, even in the Old Kingdom, and the figure could only be related to a particular individual when the inscription was added.”(Orcutt) And this is something that doesn’t help us much considering we know the sphinx to be thousands of years older than when we have the first inscription into it. Another problem we see with the face is that it was rushed work. “Its left (north) eye is higher than its right (south) eye, and its mouth is a bit off-center. The axis of the outline of the head differs from the axis of the facial features. The quality of details apparent on the face of the diorite Khafre are absent from the face of the Sphinx.”(Orcutt) With information like this we can assume that the workers who built the face where not working while the person whom this was modeled after was alive. Along with the face there is a great debate about whether or not the sphinx had a beard. A beard was found in pieces around the Sphinx and now resided in the British Museum. Although this beard was found and may have been on the sphinx at some point there is not accurate record that the beard was an original piece because that beard with the head dress are more New Kingdom and we know that the Sphinx was created before then. 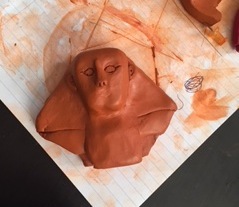 “There is some evidence that a ceremonial beard was added to the Sphinx some time after its original construction.”(Hill) That’s why in my reconstruction I did not include a beard on my Sphinx. 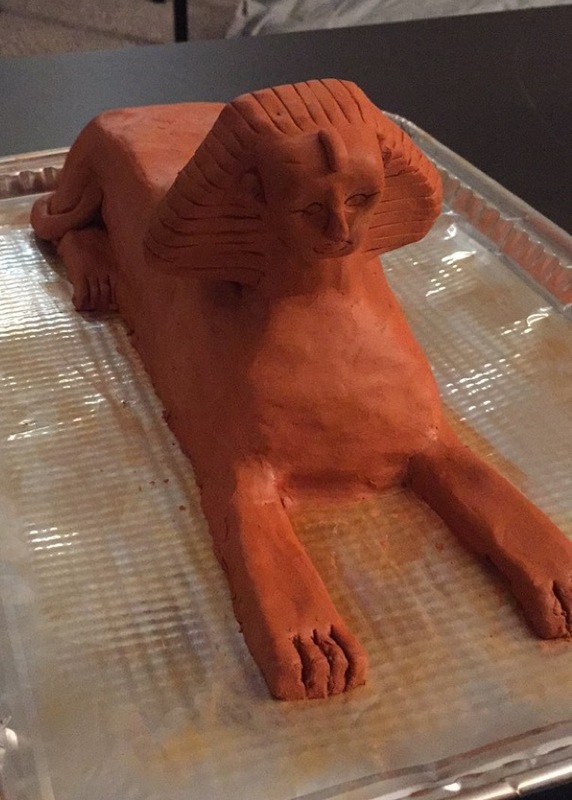 My replication of The Great Sphinx is what I believe to be the closest to what the original Sphinx may have looked like. Reconstructing something so enigmic real opened my eyes to all the different studies and theories that surround history. Gray, Martin. The Great Sphinx Facts. 1982-2014. <http://sacredsites.com/africa/egypt/great_sphinx_facts.html>. Hawass, Dr. Zahi. The Sphinx Book: “The Secrets of the Sphinx Restoration, past and present”. Published by Samir Gharieb Director of the Development Fund of the Ministry of Culture in Collaboration with Mr. Mark Linz, Director of the American University in Cairo press, 1988. Hill, J. The Great Sphinx of Giza. 2010. <http://www.ancientegyptonline.co.uk/great-sphinx.html>. Orcutt, Larry. The Sphinx Indentity. 2000 . <http://www.catchpenny.org/face.html>. One of the most complex goddesses in ancient Egypt was the goddess Hathor. Hathor was the mother of all gods and goddesses in ancient Egypt. “With her name meaning “the house above”, it is little surprise that Hathor was an Egyptian celestial Goddess, the Mistress of the Heavens.” (Billinghurst 1) Hathor wasn’t only seen as a mistress of the Heavens, she also was the “Egyptian patroness of lovers, the protector of women and children, and beloved of both the living and the dead.” (Billinghurst 1) Hathor was so important to the Egyptians that she adapted many different roles but she really stood out because of her influence in both the living and the death of Egyptians. Goddess Hathor was represented as cow because she is seen as giving sustenance to her people, or a beautiful woman with the horns of a cow on her head. She was very popular with the old kingdom and she represents Upper Egypt. Hathor worshipers originated very early on (3rd millennium BCE). “In ancient Egyptian religion, goddess of the sky, of women, and of fertility and love.” (Encyclopaedia Britannica) Although she had a strong role in the living she played a large role in death as well. Hathor was seen as welcoming the dead to the other side and she would keep them safe during their journey. Hathor also has a holy day on September 17th when mirrors are place around her temple because mirrors where sacred to her and she is the goddess of beauty afterall. “The festival of the Valley” is also associated with Hathor, which took place in Thebes. “During this festival the kas (or spirit) of the dead were revived. A lightened torch was extinguished in a bowl of cow’s milk, symbolizing rebirth and the successful return of the dead to Hathor.”(Billinghurst 3) Hathor played many different roles and was worshiped for many different reasons and in many different ways. The image above is “The Head of a Cow Goddess (Hathor)”. 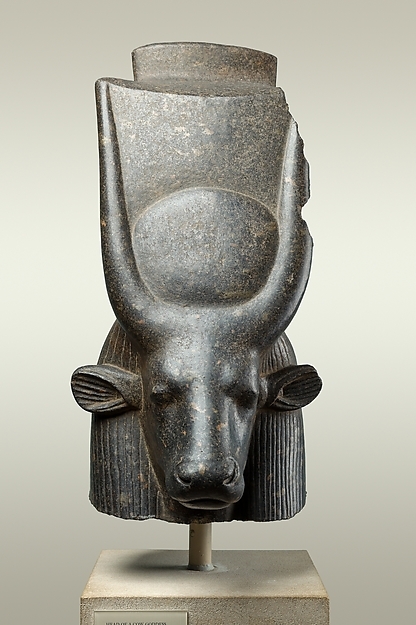 This image is a picture of a sculpture made out of diorite that represents the goddess Hathor when she is represented as a cow. We not only see a beautiful face of a cow but the cow has some human assets to go along with it. The cow has a full head of hair like a human women would and sitting atop of the cows head is a crown showing its importance. This is not a particular large statue, which implies that this was something that people could pray in front of in a temple or it could be moved around to always have a part of the goddess with them. This statue was most likely made to honor the Goddess Hathor and was made at this size so that people could move it around with them if need be, to show Hathors importance in many different aspects of life. “Hathor”. Encyclopædia Britannica. Encyclopædia Britannica Online. Billinghurst, Frances. Temple of the Dark Moon. Insight, 2005.